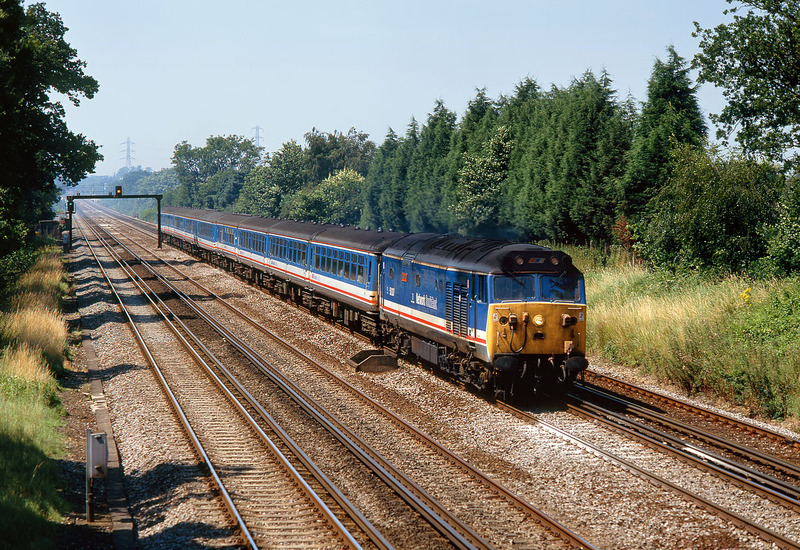 50037 Illustrious passes Old Basing with the 1O35 09:45 Exeter St Davids to Waterloo Network SouthEast service on 29 July 1991. Not only was this my only visit to this location during the last days of loco haulage on the route, but this is also my final picture of 50037, which was withdrawn from service less than a month later. I also managed to miss getting a picture of it in 'Laira Blue' livery a few years previously, but as it did virtually no work whilst in that livery and was quickly repainted, I was not alone in missing it and pictures of it in that condition are very rare.